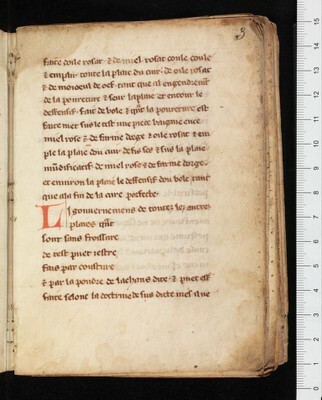 Fragment of a contemporaneous French translation of the Chirurgia parva by Lanfranc of Milan. This small-format booklet is incomplete; it presents the oldest remaining witness of the work; the other four surviving manuscripts all date from the 15th century. Based on a text comparison with the Latin version, one must probably assume the loss of a quire at the front as well as at the back.